I dont know how far this is true, but It was in a mail I received on the internet today. Whenever someone tells you the urban legend �NASA spent millions on a space pen, but the Russians used a pencil,� you can show them this screenshot from the just-launched Soyuz TMA-05M mission to the International Space Station. That�s Russian cosmonaut Yuri Malenchenko, using a Fisher Space Pen. The truth is, both Russian and American space travelers used grease pencils on early missions, since standard ballpoints didn�t work in zero gravity. Grease pencils were problematic, however, since floating pencil particles could pose a hazard to electronics and air systems. Paul Fisher developed a thixotropic ink pen that could work in zero-gravity � and gave the idea to NASA for free. 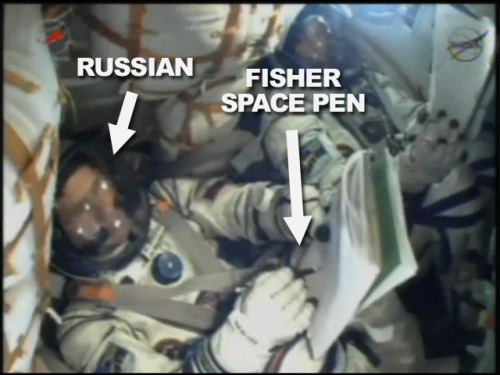 Today, both NASA and Roscosmos use Fisher Space Pens. .............Today, both NASA and Roscosmos use Fisher Space Pens. Jazakallahu khair for that feedback.